The RDS Weighlog Alpha 10 loader scales incorporate the latest colour touch screen technology providing a user friendly on board weighing system with batch blending that is suitable for Loaders, Tractors, Telehandlers, Forklifts, and Trailers. Very popular, the RDS Weighlog Alpha 10 loader scale is an advanced onboard weighing system designed for industrial and agricultural loaders. This instrument is not water proof, suitable for cab units only. When used in the Agricultural industry, the Weighlog Alpha 10 is able to be used with up to 10 different loader attachments such as buckets, forks and soft hands as used with tractors and telehandlers. The Weighlog Alpha 10 can also be retrofitted onto compact wheeled loaders, forklifts, dumpers and skid-steer type loaders. The Weighlog α10 measures hydraulic pressure at a set position on the lifting cycle. The system compensates for pressure changes in the system and works out and displays the nett weight of the product lifted and adds it to the memory total. Up to four pressure sensors can be used – as required with a lot of the modern Telehandlers. Strain sensor technology can be used on some machines as an option. Jobs can be saved to an SD card. Product data can be viewed on instrument in the tractor while other data including date, time, customer, product, weight etc information can be opened in excel. 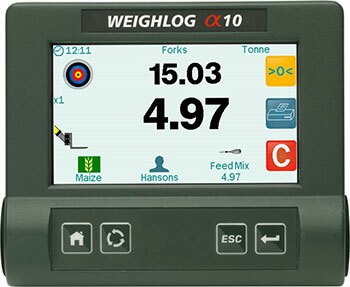 Know the weight of what you are feeding out, spreading or loading a truck, with Weighlog Alpha 10 loader scales. An external pushbutton may be installed to accept and enter the indicated weight, and an external audible alarm is optional. The instrument is normally powered on via the ignition circuit and recalls the function selected when last used.